Today seemed like I was doing better. Yesterday the kids got an unexpected package in the mail. It was from their great grandmother. 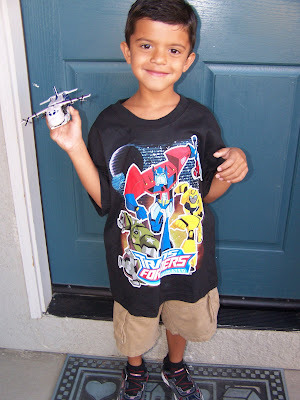 She was shopping and got Pravan a transformer shirt. He was thrilled as it glowed in the dark. It was a size 8 and huge on the kid but he insisted on wearing it to school today. Priyasha got a cute purple shirt with a heart on it. That was very thoughtful of great grandma.Thank you grandma. The kids love it. 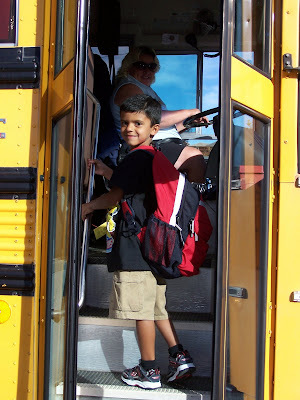 Since today is the first day Pravan will ride the bus to and from school I had to capture the moment. 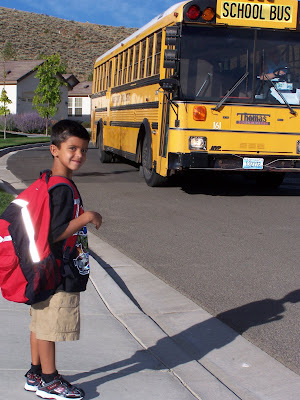 It was hard to say goodbye but I know he is having a good time in school. I then cleaned up and took Priyash to the library. I would have stayed home if Candice did not invite me. Some how I do not know how to have a quiet lazy day. Priyasha loves story time and I could not deny her this privilege. She had a great time. I was feeling drained from yesterday's emotional roller coaster. After story time I came right home and Priyasha and I had a picnic lunch in the backyard. 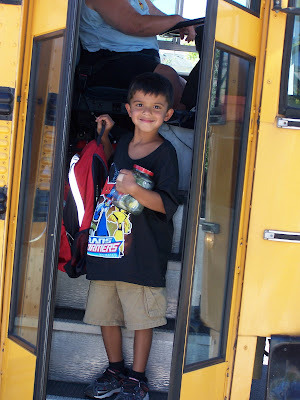 Pravan also came home with the bus. I had Priyasha nap around 2pm so she would be asleep when he came home. He was happy when he got off the bus. I was glad to see him. He told me all about his day at school and we had a snack together. He seemed tired today. I love it when he is home. Now that he is gone all day I seem to love him even more and I miss him tons. Pravan got this shirt in the mail yesterday. It is from great grandma for no reason. She loves him, that is a good reason. She saw this and thought of him. It was a surprise to get a package and as you can tell he loves it. He insisted on wearing it to school although it was too big. He is excited to ride on the bus again. He is listening to me say " I Love You "
Here he is coming home clutching the glass jar he took to school. Inside this jar is a dead dragon fly and he took it to school to show the class. He was happy about that as it was the highlight for the kids. They just love bugs. I only care for the ladybug.